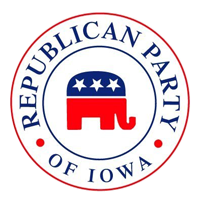 This platform was adopted at the 2018 Iowa GOP State Convention on June 16, 2018. As Republicans, we uphold the principles of individual responsibility and liberty, adherence to traditional moral standards, a strong national defense, a free enterprise system and equal rights for all. Respect for the sanctity of human life, and freedom of religion and the free exercise thereof. We believe in retaining the original intent of our Constitution. We believe high moral character is a necessity for public servants. The highest standard of character should be embodied in both private and public life. We encourage the proliferation of these principles and their passage to future generations. We strongly believe in the constitutionally protected natural right of individuals to keep and bear arms, as recognized and protected by the Second Amendment, and we support the repeal of existing laws that infringe upon those rights. We support the addition of “castle doctrine” provisions to Iowa law. We call for the repeal of sexual orientation as a protected class in the Iowa Civil Rights Code and reject any additional similar legislation to Local, State or National Code. We support full local control in schools and therefore oppose any forced national education standard. We support authorized personnel with the proper training, being allowed to carry firearms in our schools. We support teaching Iowa and US Constitutions in depth in our schools. We believe that voting rights be restored statutorily rather than by Executive determination. We support the elimination of Gun-free zones. We demand that all Iowa DNR game wardens respect landowners and hunters 4th amendment constitutional rights. They shall have legal probable cause and/or search warrant to be on private property. We support elimination of all state and federal “estate” taxes, but support retaining the stepped-up basis for estates to ensure heirs inherit assets with no additional tax burden. We assert that bequeathing citizenship to babies born to non-citizens in the United States is a misinterpretation of the 14th amendment. We believe our servicemen should serve only the United States, our Constitution, and the American Flag. We are adamantly opposed to United Nations oversight of our military units, ceding national sovereignty to any foreign body, or to the establishment of a one-world government. We oppose any United Nations initiative including agenda 21, which restricts or destroys the property rights of Americans. It shall be deemed illegal for any individual, person, establishment, entity, and government sub-division to enable or aid and abet illegal immigrants to have sanctuary from immigration officials and laws. We support prosecution of those having sanctuary cities or States and the withholding of Federal or State funds from these cities or States. We support restoration of the previous congressional EMP commission and the appropriation of money to harden the U.S. electrical grid to protect it from being destroyed by either natural or nuclear weapon induced EMP and cyber attacks. We oppose amnesty for any illegal aliens. We support a free and open choice healthcare and medication voucher system for veterans. We believe energy independence must be the goal of our public policy. We support legalizing industrial hemp for commercial use. We support the ban of traffic control cameras. We support legislation providing for tax deductibility of child support paid by the non-custodial parent. We support amending current law to exempt agricultural commodity hauling vehicles from excessive electronic logbook regulations. We support abolishing the Iowa Alcoholic Beverage Division and allowing the free market to take over distribution of alcohol. We support the adoption of English as the official language of the United States of America to strengthen and unite us as a nation. We acknowledge that judges and courts do not have law making authority or the powers to repeal or strike down existing laws. Only legislatures have this power. Judges and courts can only give opinion. We affirm the rights of all, including minorities and the disabled to freely pursue economic opportunities. The Republican Party commits itself to providing equal opportunity to all citizens regardless of race, gender, disability, or economic status. Republicans encourage public/private programs offering skills training and apprenticeships in the skilled trades, with a focus on minorities, women, the disabled, and veterans. Republicans encourage the participation and advancement of all citizens within the party, regardless of race, gender, or disability. Republicans will actively recruit members regardless of race, gender, or disability.